Santa Cruz County Fairgrounds respects and protects the privacy of our customers and those who use our websites. The following Privacy Statement provides details about how your personal information is collected and used. This privacy statement applies to the network of Santa Cruz County Fair websites. Santa Cruz County Fair provides users the opportunity to opt-in, opt-out via a link in the footer of most email messages. These options are made available when you sign-up for our email lists and in email messages delivered from our marketing company and from the Santa Cruz County Fair Office. Alternatively, you may email us at . Santa Cruz County Fair is the sole owner of information collected on this site. We will not sell, share, or rent this information to others in ways different from what is disclosed in this statement. 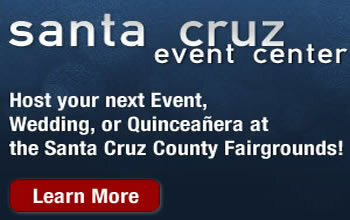 Santa Cruz County Fair collects information from our users at several different points on our website. Our websites offers several opportunities for visitors to register for promotional and informational mailings. These registration forms are often linked to Santa Cruz County Fair's mailing lists and require users to give contact information (such as name and email address). Users may opt-out of receiving future mailings at any time (see the choice/opt-out section below). We will never share, sell, or rent your personal information with third parties for their promotional use. Occassionally, we enter into contracts with third parties so that they can assist us in servicing you (for example, providing customer service). The contracts prohibit them from using any of your personal information for their own purposes, and they are required to maintain the confidentiality of the information we provide to them. We may disclose or report personal information in limited circumstances where we believe in good faith that disclosure is required under the law. For example, we may be required to disclose personal information to cooperate with regulators or law enforcement authorities, to comply with a legal process such as court order, subpoena, search warrant, or law enforcement request. Santa Cruz County Fair takes care to reinforce the importance of our website visitors' security and privacy among our employees. Our employees are trained and required to safeguard your information and, using physical, electronic and procedural safeguards, we restrict access to personal information to those employees and agents for business purposes only. Additionally, we use internal and external resources to review the adequacy of our security procedures.